Finding the perfect shoe for any foot deviation can be quite a daunting task. 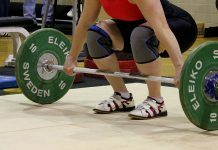 In this article, we will look at how supination can impact your feet and how the proper shoes can help alleviate foot pain and prevent injuries. If you are a runner or just suffering from the pain caused by supination you have come to the right place, here we will look at the top 10 shoes for both men and women to help alleviate all pain and discomfort caused by supination. These shoes have also been tried and tested and offer great support for people with supination. We focus especially on the sports side of things, but we will also have a look at the top casual shoes and sandals for the everyday man and woman. Supination, in short, means the inward turning of the ankles, thus forcing a person to walk on the outer edges of the foot. People with supination won’t know they have supinated feet until they learn about the term. It is easy just to check a pair of old shoes for the footprints that we have made on the inside; this will give a clear indication of the medical condition. Supination is also associated with many medical conditions; these medical conditions can become worse over time and may even require surgery or cause problems in knees, ankles and hips. 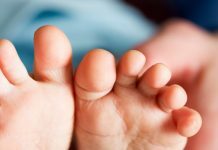 Early on in life, these problems may seem to be small, but they tend to escalate to more serious problems as we get older. Because of this, it is essential to learn how to choose the right shoes for you. Supination is a real problem, but it can be improved with the right footwear, stretches, and exercises . 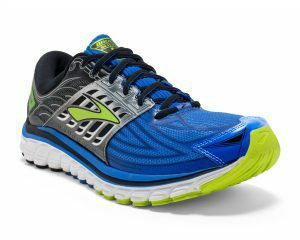 The Brooks men’s Adrenaline GTS 15 is one of their current best-selling shoes, they provide comfort and style to runners, and with the added cushioning, your foot will quickly adapt to the shoe as well. The adaptive cushioning provided by the BioMoGo DNA cushion will form and keep the shape of your feet, thus meaning if you have supination, it will feel as if you are running on a flat foot. The further benefit of the cushioning is to eliminate all joint and knee problems, to give you a straightforward and smooth run. The progressive diagonal rollbar will give you added support and keep the moisture from entering the shoe. It also has the added ability to keep your feet cool on the hot surface of the road. The best part of this shoe is the full-length segmented crash pad in the center. This will be extremely beneficial to people suffering from supination as it allows for a smooth transition in every step. For the colors, the Brooks company has added a few bold new colors to their range. These colors sure turn heads and will exert a sense of style to your feet. These colors include a charcoal black with yellow and red and a white with blue and green to give the perfect color balances. This is the perfect shoe for any fitness female fitness enthusiast. 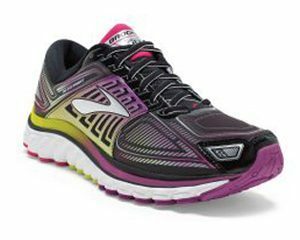 The Brooks adrenaline for women are made with style and comfort in mind. Boasting the perfect cushioning for the supinated, this shoe will easily adapt to any foot type with its BioMoGo DNA cushioning technology incorporated and the crash pad will allow women of all ages and sizes to easily transition from step to step. 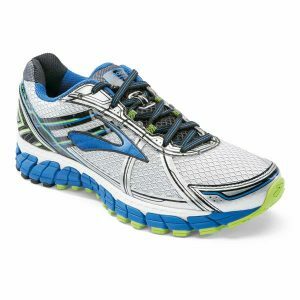 The Brooks adrenaline also has a progressive diagonal rollbar that will support your feet on the run and this feature will also keep your feet dry when accidentally stepping in puddles.The progressive diagonal rollbar also features new technology to keep your feet cool during the hot summers and to keep the sweat down to a minimum. The synthetic overlays are incorporated to add some resistance and durability to the shoe, thus meaning that this shoe is multi-functional and not only made for the road runners, The synthetic mesh will also stop mud and dirt from accumulating that may result in a heavier shoe. All of these features are great for people with supinated feet, the shoe will never let you down and is sure to give your feet all the comfort you need to have a great and comfortable run. The Asics company certainly outdid themselves with this perfect piece of style and comfort. The gel in the forefoot is made specifically for supinated feet and will fit to the exact shape of your foot, while the midsole will provide comfort and ease with every step to help protect the joint and muscle area. 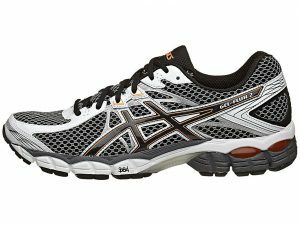 The Asics men’s gel flux has a high heel measurement, this heel measurement of 1.5 “ will contribute to providing comfort and keep the foot from getting hurt if you might step on uneven or sharp objects. This shoe has the perfect rubber grip that will stick to any surface, and it is tested in wet weather conditions. Once you decide on the Asics men’s gel flux, you will never go to any other brand as the shoe is designed and tested by professional athletes. The shoe has also been through rigorous off-road testing, giving the buyer a multi-functional shoe that may be worn anywhere in the world. Finally, Asics have incorporated high-quality materials in the shoe, giving you the benefit of running through water and muddy puddle. The materials used will keep your feet from getting wet and provide some coolness throughout the run. Key Features: Plush tongue and collar, AHAR high abrasion outsole, rearfoot gel cushioning system, removable foam insole. 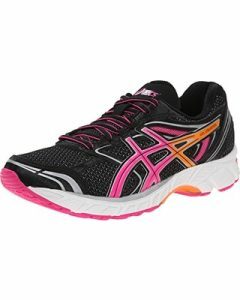 The Asics women’s gel equation is the ultimate shoe for females suffering from supinated feet. The shoe offers a high abrasion outsole, giving you the ability to let run wherever you feel without any pain or discomfort. The rearfoot gel cushioning will give runners the added benefit of having their heel protected and will enhance you off-road running performances. A plush tongue and collar will certainly turn heads as it exerts the perfect style any woman deserves. Another great benefit of having these high-quality shoes is the removable inner sole, if you are not happy with the standard cushioning, it could easily be replaced with something new and from another brand. This will save you the money of having to buy a different pair of shoes. Overall the Asics women’s gel running shoes are the perfect fit for any woman, especially athletes and runners. The shoe will also give you the benefit of running through rainy weather and mud puddles without having soaked feet, making it the perfect buy for woman of all ages. 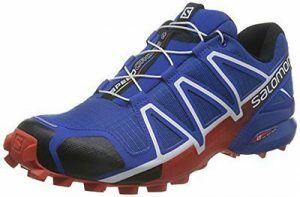 Salomon is considered to be one of the best if not the best outdoor and sports footwear brand in the world. The company puts a lot of effort and testing into all their footwear, giving you the final mixture of comfort and style. 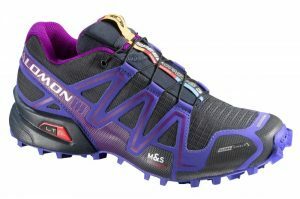 The Salomon Men’s Speedcross trail runner is definitely in a class of its own, providing athletes with supinated feet the perfect foothold every time. 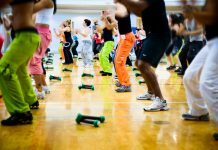 The shoe will mold according to your feet, and it will keep that form forever. The added rubber sole will protect every inch of your foot, giving you the perfect footwear for running and outdoor use. The midsole is fitted with EVA technology and it is made to suit your every need at all times, and the shoe is shaped in a new modern and refreshing style to give any person some extra style. If you are looking for comfort, then the Salomon brand has included a moldable inner cushion, preventing any surface from damaging or tearing through your foot. If they can do it for men, why not do it for women as well. The Salomon company has almost mimicked their quality with the women’s version of this great running and outdoor shoe. The dual density EVA midsole will help mold the shoe to the perfect fit for any foot and this will greatly benefit anyone suffering from supination. An added layer of mesh to the overall shoe might sound like it will be heavier, but surprisingly this shoe is made lighter than any other shoe we have seen, at just 9.2 oz for the small sizes, this shoe will never let your feet get wet and will keep your feet cool at the same time. A new quick lace system has also been added to the shoe, and the company has found some extra space to create lace pockets, this will keep you from ever snagging a tree and pulling loose your laces, giving you the ultimate running experience. If you are still not convinced then, you do not have to look any further than the ortholite insole, created to give the ultimate comfort to your feet and once you have these shoes on, you might never want to take them off. Overall this shoe is very high quality, and the Salomon company has included the experience of years working with skiing equipment into this shoe, so no matter the weather condition, you will never have an excuse not to take that afternoon jog. Ortholite insole for the perfect fit to anyone with supinated feet. Nike is renowned worldwide as one of the top 3 sports brands, and now they have created the ultimate sense of style to go with that huge sporting reputation. As we all know, American sports is dominated by the Nike company and most of the athletes receive their footwear from this juggernaut. 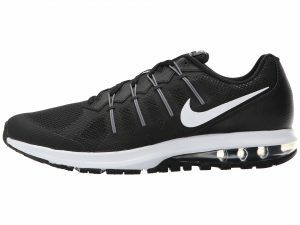 The Nike men’s air max running shoe is fitted with state of the art Flywire cables; these cables will keep your feet tightly secured, and there will never be any need for fastening the laces a second time. The shoe is primarily built for people struggling with supination, and the form of the shoe will immediately give comfort to anyone suffering from this foot condition. The full-length mesh panels will further exert comfort and security, and this shoe can easily be worn for a late afternoon run, thus providing the perfect shoe for multi-functional uses. The shoe comes in very neutral colors, and many people prefer to wear this above their work shoes, it will go entirely with a jean and t-shirt as well. Nike has also been known for their Max Air technology. The Max Air technology has also been added to give users more versatility when walking on uneven or bumpy surfaces, thus meaning that you could even wear this shoe to the mountains. Overall Nike has done a perfect job in giving people suffering from supination a stylish, yet multi-functional shoe that is lightweight and fits almost any wardrobe. Plus you will have the benefit of showing off the huge Nike sign on the site of the footwear. A great fit for the stylish worker and traveller. 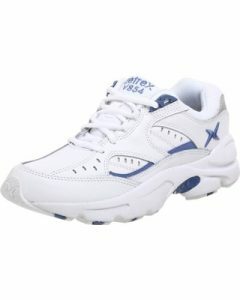 This shoe will certainly give comfort and security to your feet no matter the task. The Apex women’s walker is complete with a customisable insole to provide the perfect fit for anyone with supination problems. Strategically placed air pockets will keep your feet cool at all times and will give them the opportunity to breath comfortably, allowing longer use of the shoe. With this shoe you could simply lace it up in the morning and keep it on for the whole day without worrying about any nasty smell that may arise. Not only is the Apex women’s walker made for leisure, but also for sports uses. The voyage pods are filled with air to provide the ultimate cushion for your feet and giving added traction in any slippery or uneven surfaces. Joggers will also like the quality materials used in this shoe, as it will provide a long lasting experience and some people will never need to replace their running shoes again. If you are into fitness and aerobics, this shoe will also give you comfort from landing after every jump and the traction will help trail runners never make a bad step again. Overall this shoe will fit perfectly for the average women, not only giving them athletic support, but also support throughout the day when completing the everyday tasks. 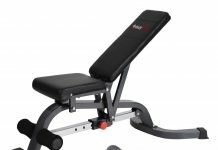 The synthetic leather is extremely easy to clean and will dry very quickly after a wash. The colors are mostly neutral to fit any wardrobe without hassles. Perfect for the everyday women and everyday tasks. Key features: Synthetic sole for even distribution of body weight, metallic snake print for a leux look and perfect style, EVA midsole for all-day comfort. If we look at sandals, it is a little more difficult to find the perfect fit for anyone with a supinated foot, but the Birkenstock soft footbed sandals hit the nail perfectly on the coffin. The EVA midsole is usually feature in most running shoes to provide comfort, but they have added this technology to a sandal, giving the ultimate comfort experience. The synthetic sole is made for molding and moving, thus allowing even distribution of body weight throughout the shoe. The style is one of the main things we look at when buying sandals and the Birkenstock company has provided exactly that. The metallic snake print is one of the most iconic looks to give an added leux look to the shoe and to make it fit any wardrobe. The shoe is made to be adjusted anyway you like, and if you prefer a tight fit, you could easily adjust the suede straps to your heart’s content, and this feature also provides multi-functional use, making it the ultimate hiking and beach walking sandal at a very affordable price. With a long line of footwear for women, the orthaheel company designed this shoe to fit perfectly to any supinated feet. The EVA footbed will evenly distribute the weight across the sandal, thus giving an even foot movement and comfort when walking. The TPR outsole is made to provide comfort and extra protection to women suffering from supinated feet and the sole is made to withstand the impact and weight of men. This will give users longer use of the shoe and the added benefit of walking on almost any surface. The orthaheel tide sandals are extremely lightweight and you may even forget you are wearing them, the added neoprene liner will protect the upper areas of your feet and provide an easier movement when walking. The best feature is the rubber sole that will provide traction and comfort. This shoe can be used to walk on a wide array of surfaces; ranging from the beach all the way to the rocky areas of the mountain hiking routes. 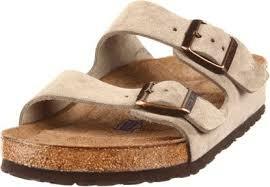 Overall this shoe is made for every woman and will easily give you the comfort and secureness your feet deserve. This shoe is also considered a once of buy and will last extremely long to help save you some extra money. Comfort: A shoe must provide comfort. Sometimes the brand becomes irrelevant and we only look for something comfortable. If your feet are uncomfortable it could easily spoil your day and hurt you once you start to exercise or run. High arched padding in the heel area: When you have supinated feet, it is important to choose shoes that have extra padding at the back. This will help absorb the strain on the foot with every heel strike. Ankle support: As supination sufferers tend to bend their ankles inward, it is important to have a shoe that is tightly secured and supports the ankle. This will keep the ankle more rigid and help take of some strain of the ankle. Durable outer padded sole: As you are supinated, the wear and tear on the outer part of your shoe may cause it to tear or even disintegrate. Shoes with extra padding for the supinated will provide value and also added comfort. 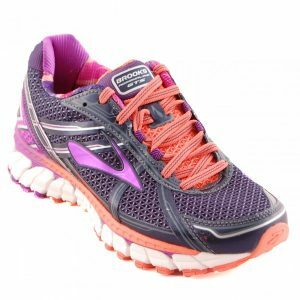 Whether you are struggling with supination or if you are just looking for a great running and multipurpose shoe, these shoes will be perfect for you. As more and more people tend to get supinate feet, these shoes are sure to help you overcome all of the problems associated with supination.